Anoop: My name is Anoop Nannra, I'm head of the blockchain initiative here at Cisco where I lead product and business development. 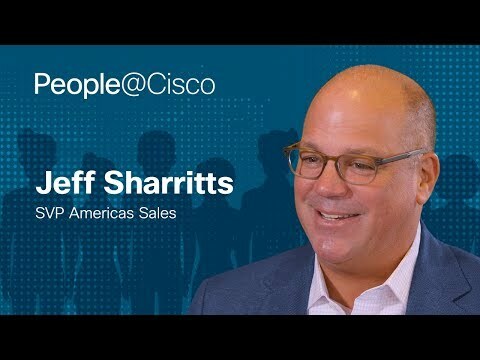 Stephanie: Why is Cisco invested in something like the blockchain? Anoop: Blockchain in the enterprise context is right up our alley. Our view is that the technology will evolve similarly to how the Internet did, with separate networks that will eventually interconnect with one another, and where interoperability will be critical to drive adoption. We're looking at financial services—banks, exchanges—and we're also looking at how blockchain technology is used to transform supply chains. For example, if you are a manufacturer of a high-priced good, your customers and your ecosystem want to ensure that they are purchasing or delivering a genuine article. Blockchain technology can give these parties the means of independently determining the chain of custody of goods. More examples in supply chain are opportunities to look at how product quality can be improved and therefore how additional services may add more value. If we discover a set of issues within a product and can determine exactly when or how certain components entered into our ecosystem, we can very quickly take a forensic view of how the product was actually built, who was involved, and when — which is a value add delivered by blockchain. Stephanie: What is the blockchain team working on? Anoop: We are evaluating a number of blockchain technologies and their application not only to our business, but also how they can be applied to the businesses of our customers. We see the technology driving behavioral and process changes in our customers' ecosystems, and through both thought and action leadership, a great many opportunities. My sense is that this is a space that does not need another white paper—what it needs is companies delivering on the value of blockchain technology. Stephanie: Cisco is a large company, but there seems to be several startup-like groups within it—can you tell us more about that? Anoop: I think it's important for big companies like Cisco to have startup-like spaces because innovation can come from many parts of a company. Innovation thrives in an open and creative environment. The blockchain initiative was developed in this type of environment by what's been called "intrapraneurs"-- people who behave like entrepreneurs while working in large organizations. I see Cisco's role as helping enterprise blockchain transition from science fair experiments into an actual industry. Intrapraneur groups, such as ours, within enterprises are critical to addressing these early and nascent technology spaces and helping navigate and lead transitions for the whole company. A lot of this involves working with partners, customers and startups to drive a much broader innovation agenda while at the same time being nimble and responsive to changes in the technology space. Stephanie: So, what's on your desk? You can't be a blockchain person without having some cryptocurrency. This is where I have my ledger wallet, ledger nano S—a cryptocurrency hardware wallet. It's secure and tamper evident, so you can have digital assets like Bitcoin transferred and stored. Interestingly, they just passed the 1M units sold milestone. We are actively involved in Open Source, and here I have the White Paper from the Hyperledger Architecture Group. This is where we're contributing design philosophy and strategy, and looking at how blockchain can be utilized in the pharmaceutical space. I've also got a bottle of wine here. As a hobby, I'm also a winemaker. Even in the wine industry I'm seeing a lot of opportunity for innovation and the application of blockchain technology. We are starting to see the emergence of smart corks that are cryptographically signed, so you can track the chain of custody of valuable high-priced wine from manufacturer to distributor to retail outlet. As a collector of wine, you have the ability to readily and independently showcase the genealogy of the wine that ends up in your cellar. I've actually been cataloguing the more important moments and milestones in our blockchain initiative development with a VR camera. This provides an opportunity to share cool innovation that can happen in and around the work that we're doing. For folks who aren't able to attend in person, we want to play video back for them as if they were here. As a part of my trade mission activities, I'm delivering a message that we need to evolve blockchain thought leadership to action leadership. I've visited forward thinking governments in the Middle East and also the visionary government of Singapore. These government officials and policymakers are responding positively to the message that we need to mature the blockchain space and technology. My son decided to give me an ID card and it's basically an agenda for when I'm supposed to leave work. Apparently, I'm the vice president of fun, games and adventures. We have scheduled evenings for activities. By the way, the caricature he drew of me has far more hair than I actually have. Stephanie: Who's the president of fun? One of my coolest Cisco memories--A couple of years ago I managed an event where we actually live streamed Stephen Hawking from an office in Cambridge and presented him on stage as a hologram at the Sydney Opera House. I was a part of the crew and had a backstage pass to the Opera House, which is an amazing building. It was an environment where we were able to showcase a very high performance, low latency video network, protected by Cisco Meraki solutions—with very high resolution, high quality streaming as well. The response from the audience was fantastic; feedback was that it was a deeply visceral experience for many of them. Learn more about Cisco and blockchain here.